For years, it was the Camry sedan that brought customers in droves to Toyota dealerships. However, times change and today the crossover rules while the sedan has been pushed aside. When it came time for Toyota to completely redesign its long-running and hot-selling RAV4 crossover, it knew it had to get everything right. The competition is tougher than ever, but Toyota also wanted to expand the RAV4’s appeal. In short, it had to as part of an effort to lure more male buyers. Has the all-new accomplished this? Let’s find out. The fifth-generation RAV4 could not look more different than the model is replaces, which lacked emotion. It was the refrigerator of crossovers, if you will, and yet it was still the best-selling passenger vehicle in the US last year, if you don’t count pickup trucks. But just look at the redesigned RAV4; it actually looks far more SUV-ish. The all-new sheetmetal is quite a dramatic departure from before, with styling directly inspired by last year’s FT-AC Concept. We’d describe the new look as rugged. Note the more aggressive grille, fog light surrounds and wheel designs. The wheel arches have been angled off and are further augmented with black trim. The new RAV4 is also the first TNGA vehicle to receive optional (standard on Adventure and Limited trims) all-wheel drive. It’s actually a pretty trick system called Dynamic Torque Vectoring AWD with Driveshaft Disconnect. It sends up to 50 percent of engine torque to the rear wheels when needed, and can properly distribute that power to the left or right rear wheel for even better handling. The rear driveline disconnect feature allows for the AWD to be disabled when it’s not needed, with power instead going to the front wheels only, thus improving fuel efficiency. 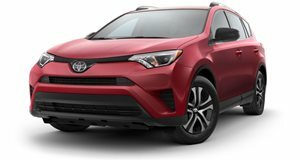 There are two other AWD systems available on lower trim levels: AWD-i on the hybrid, and the non-dynamic torque vectoring system for the straight up gasoline-engined RAV4s. All RAV4s are equipped with Toyota’s Entune 3.0 multimedia system located in a 7-inch touchscreen on top of the center stack. An 8-inch screen is optional. Both Apply CarPlay (no Android Auto?) and WiFi are also standard fare. There are a total of 11 speakers connected to the JBL sound system. The new interior is without question a step above the previous model. Everywhere you look you get the immediate sense of high quality materials and splendid fit and finish throughout. Ergonomics have been improved, and head room increases for second-row occupants. The third-row option has been eliminated. Toyota claims increased towing capacity as well, though no figure has been given. The outgoing RAV4 was capable of 3,500 pounds. Standard safety includes eight airbags, pre-collision warning with pedestrian detection, lane departure alert with steering assist, and the new lane tracing assist. Toyota Safety Sense 2.0 adds automatic emergency braking with nighttime pedestrian and daytime cyclist detection, along with lane keep assist with Lane Tracing Assist. The manual parking is replaced by an electronic parking brake with full-speed dynamic stopping. Toyota has not announced 2019 RAV4 pricing, but don’t expect a big increase over the outgoing model, so figure a base price around $25,500. Gasoline-powered RAV4s will go on sale at the end of this year while the hybrid will hit the market in early 2019.